Last month, I talked about the need for unemployment to rise to the top of the agenda during 2010, having been a distant third behind the banks/NAMA and the public finances in 2009. Last week, the CSO published the latest detailed figures on the Live Register, which confirm the gravity of the unemployment situation facing the country. In particular, the numbers highlight two dimensions of unemployment that cannot go ignored: regional differences and unemployment of young men. So much of the public debate last year revolved around the economic problems of middle-aged people. For Ireland to develop sustainably, the economy needs to be able to create jobs for its young. For Ireland to develop anything like the model of regional balance envisaged in various policy documents such as Towards 2016, it also needs to be able to create jobs outside Dublin. To see where we are now relative to these aims, it’s worth taking a step back to the summer of 2006. Young men are unemployed and signing on. As discussed before, increases in the Live Register have proven to be a very good predictor of the recorded increase in unemployment. Whereas there were just 18,000 young men signing on in mid-2006, there are now (as of January 2010) over 55,000 signing on – meaning that at least 37,000 young men have lost their jobs. To put this in perspective, those currently signing on the Live Register represent one in five young male workers from 2006. Young men are dropping out of the labour market. The participation rate fell from about 60% in 2006/2007 to 50% by mid-2009. This is the equivalent of another 26,000 job losses. Put another way, the loss of a further 15% of boomtime jobs for young men are not showing up in the statistics, because these young men are opting out of working altogether. These astonishing figures add up to almost 100,000 job losses in a segment of the population that had only 175,000 employed at the peak of the boom. Over 55% of jobs for young men have disappeared. One occasionally hears the argument that, as bad as things are, an increase in unemployment of ten percentage points means that 90% of us are in more or less the same position now as during the boom. What these figures show is that while the rest of the economy has lost perhaps about 10% of its jobs, young men have lost more than half theirs. Even though who neither are male and under 25 nor have friends who are should be able to grasp the importance of turning this around. Even at its most basic, it represents a huge drag on the government finances, not to even mention the lost output and societal wellbeing behind the figures. The maps below compare the first quarter of 2007 with the best estimates available for January 2010. The number is a percentage, showing the estimated proportion of the male under-25 labour force signing on to the Live Register in each period. The graph (which is available over on Manyeyes) shows not only the huge increase in unemployment over those three years but also the regional differences that have emerged. 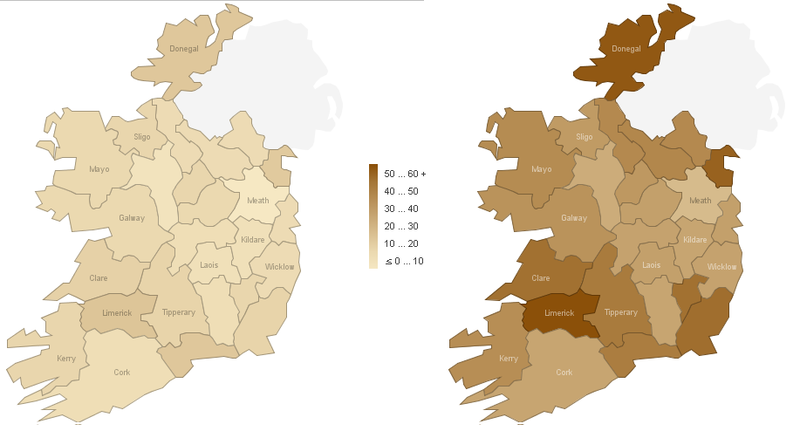 The three largest cities Dublin (and its hinterland in Meath, Kildare, Wicklow), Cork and Galway are relatively unaffected, as are – perhaps surprisingly – many parts of the Midlands where their older siblings have found themselves trapped in negative equity. On the other hand, in a number of areas, including Limerick and Waterford cities as well as Donegal and Louth, at least half of all young men are signing on. In Limerick, already a relative unemployment blackspot during the boomtime, two out of every three young men are signing on at the moment. This is bleeding over into counties Clare and Tipperary as well. Perhaps these figures are not surprising. There are those who point out that this crash was bound to come, purely because of how reliant our male employment had become on construction. Indeed, these job losses may be led by construction, which had employed one in three men in this country by 2006. But the job losses have ultimately come from all sectors. And – more importantly – the eventual return of a healthy economy (and a healthy construction sector) will mean the employment of no more than one in six men in building, not one in three. Therefore, Ireland must look to alternative solutions to get one half of its future labour market employed. Unfortunately, as a short-term valve, emigration will have to play its part, particularly for those for whom Ireland was a new home. But one must also look at falling participation rates as a blessing in disguise. A record number of mature students – at 15,000, not a panacea but not to be ignored – a record number of mature students are applying for third-level education under CAO this year. The obvious next question, though, is whether the qualifications we are providing for our young people – men and women – are what a 21st Century labour market needs. Part of me is screaming “statement of the obvious” here. I seem to recall some figures as unemployment first started to rise that for every 1 woman losing her job, 7 men were losing theirs. Women were more likely to be going into public service roles while men were more likely to be losing their construction related jobs was the rationale at the time I believe. The problem for me is that while I agree in principle with what you’re saying, I’m at a loss to predict what kind of jobs we can get to absorb those who went into construction. I know that construction related jobs bled into back office related roles such as law/accounting/architecture but again, options for career change are somewhat limited there. I think this involves a lot more long term planning and not so much in terms of industry because historically, industries come and go over time as society changes. I don’t want to say “progresses”. Either way I’ve long felt that the education system needs to be tackled in terms of how we use it to feed into the economic future of the country. Currently, there’s a tendency for bandwagon hopping with each generation having an industry which is held to be a good industry to get into because it’s good for employment or money. When I left college, IT was the catch all career of choice. 10 years later it appears to have been construction. This sort of attitude to jobs and training isn’t really sustainable. Some may be familiar with the scale of the problem here or, as you point out, not be surprised given how many were in construction, but I had yet to hear of a job destruction rate of almost 60% (closer to 70% if there has been net emigration of young men of the order of 25,000 since April). Plus, no harm to keep it in the public eye – well at least, do my small part in that anyway. On your more substantive point, I totally agree. The final paragraph is not meant to suggest that ensuring our education system can easily change to match current and future labour market needs. Rather it is meant to make sure the link between what’s happening now and where we’ll be in ten years time are fundamentally connected. The focus has to be on future-proof skills, rather than future-proof industries, particularly as internationally mobile projects are aggregating by activity and not by sector. IT as an industry was a late-1990s plaything alright, but IT literacy will be as fundamental as basic literacy and numeracy for an increasing proportion of jobs. Nothing to worry about though Ronan, we’ve turned the corner and have a march down O’Connell Street in 2016 to look forward to. It’s all good in Biffostan. Since the nominal value of the punt broke above parity with sterling 2 years ago, employment has decreased by a quarter of 1 million.The same scenario looms over the next 2 years.We don’t have a large enough pop to sustain lots of domestice services such as shops and cafes.Employers nwill always hire people with lots of experience-when did anybody last see a half decent job aimed @ recruiting a school leaver?.My local prim school in Dublin received 600 applicants for 2 teaching posts last summer!. While banks/NAMA and the public finances did grab more attention last year than the rise in unemployment, it’s not really and either/or for the government to pick which crisis to solve. These three crises are inter-related and need to be tackled together, otherwise they will become intractable. We can have all the jobs taskforces, employment subsidies and welfare-to-work schemes we want but they will count for little if the State has bankrupted itself and we have failed banks unable to extend credit to businesses to create those jobs which are needed. Balancing the budget and fixing the banks will go a long way towards improving the underlying employment environment. Active labour market policies will merely heighten this. @ Kieran and @ Ronan – outside of CDS rates, are there any other indicators as to whether Ireland might default, or leave the Euro? Too focused on construction and other dead-end jobs. Did I read somewhere that you won an award? If so, big congrats to you. Enjoying your blog, Clare!